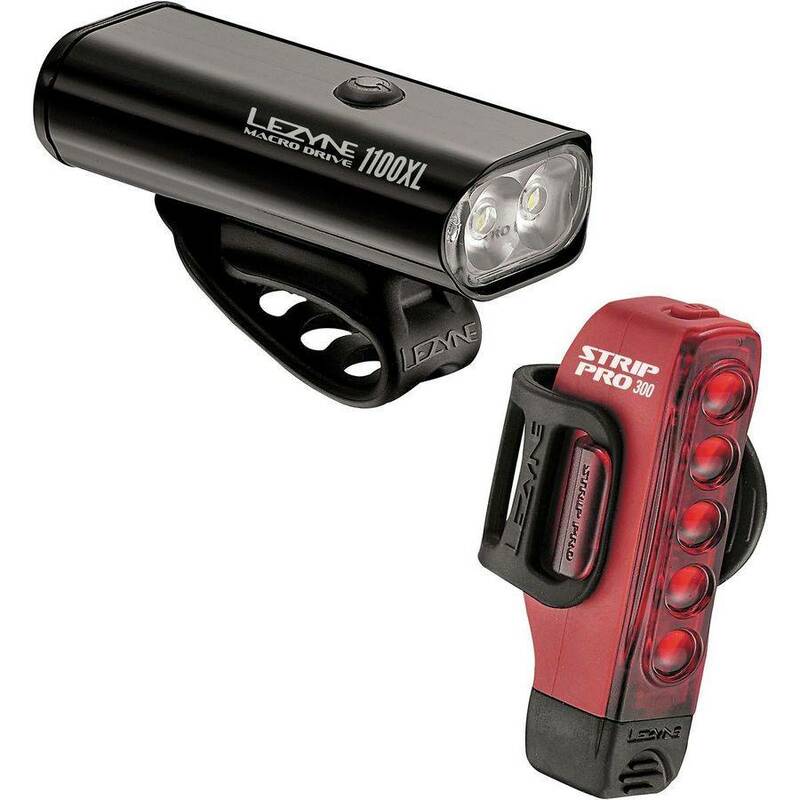 Stay safe and light up your next ride with this high-performance LED cycling light pair. The Macro Drive front light from Lezyne is compact, durable and heat-dissipating machined aluminum body. The front light also features two market-leading ultrahigh-output LED’s delivering up to 1100 lumens. Optional Overdrive Race Mode toggles between Overdrive and Economy modes only. Mode Memory function returns to selected mode after turning off. Enhanced MOR (Maximum Optical Reflection) lens with side visibility. High-speed 2 Amp USB charging capabilities (with compatible wall adapter). Versatile strap securely mounts to all standard bar shapes, including aero bars. Advanced Li-Ion battery for superior run time. The Strip Drive rear light is a powerful and versatile LED taillight. Light and durable co-molded lens/body construction. Unique aero and round post compatible design. Five ultrahigh-output LEDs delivering up to 150 lumens. Mode Memory function returns to selected mode after turning off. Eleven unique modes including two high-visibility Daytime Flash modes. Enhanced lens with built-in side visibility. Integrated cable-free recharging USB stick.